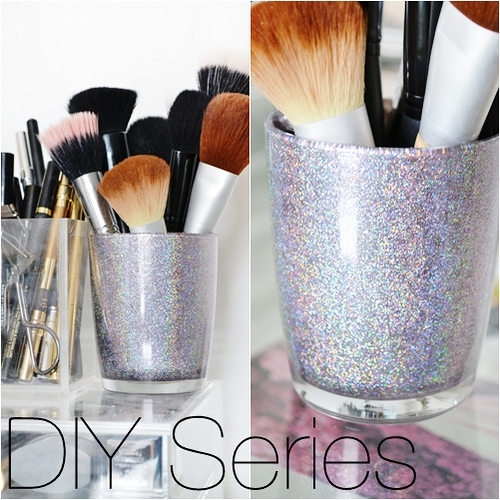 DIY: Holographic Makeup Brush Holder! Autumn for me always feels like the start of new things - wearing warmer clothes, new TV series at the weekend, darker nights and new projects. So I thought I would start my own DIY series as I do enjoy getting crafty. I already have a few ideas in my head and come November I can even do afew DIY gift idea for Christmas... maybe DIY mini bath bombs and homemade soap etc. But to start off my series I thought I would do something fun and very easy! To make a holographic or glitter makeup brush holder it takes no time at all and it's something you can do whilst watching TV even. There is one key ingredient to this which I am pretty sure most makeup lovers will own! So carry on reading to find out how to make your own pretty makeup brush holder. 1. The jar I actually used was a clean Nutella jar (the one in the first image has a pattern to the bottom but most are smooth). But you could easily you a standard glass tumbler... I just liked the curve of the Nutella jar... which I had been using as a drinking glass originally haha. After washing the jar I rubbed a cotton wool pad with some nail polish remover over the inside just to remove any grease. 2. As you can see the secret ingredient to this is nail polish! Any glitter polish will look great but you really want to go for one what is more of an opaque glitter so that you don't use up all the nail polish. Also to cut down on how much glitter nail polish I used I decided to use another nail polish in a similar shade just to fill in all the tiny gaps - I really recommend this! I must stress that while doing this it is important you keep a window open as the fumes can be quite strong! 3. First you want to pour a small amount of the glitter nail polish in to the bottom of the glass then spread it evenly on the bottom an up the sides, spreading it as thinly as you can. I then did the same up the sides of the glass, just pouring a little bit then spreading it until the whole of the inside was covered. I then quickly dried it with my hair dryer on the 'cool' setting such took a few minutes. Once it was nearly dry I added another layer of glitter nail polish, which is when it started to look really good. 4. I then dried the second coat with the hair dryer but you could leave it to air dry. Then for the final step I added a coat of metallic silver nail polish which gave it a perfect finish! So if you are going for gold glitter use a gold metallic nail polish but if you are using pink glitter as long as most of the glass is covered you could use a creme pink nail polish. 5. Leave to dry over night somewhere open as the fumes from the nail polish can be quite strong, so you don't want it in the room you are sleeping in while it is drying. Of course you aren't limited to just using the jar as a brush holder, you could use it to keep your eyeliners or lip glosses in or even on your desk for pens & pencils. Next in my DIY series... a yummy Vanilla Sugar Body Scrub!